Anyone interested in Russian literature will know that it is all too easy to be distracted by those two giants of the country’s literary Golden Age, Tolstoy and Dostoyevsky (or Dostoyevsky and Tolstoy, depending on your views…), writers who overshadow their countymen to such an extent that generations of great writers struggle to receive the recognition they deserve outside their home country. 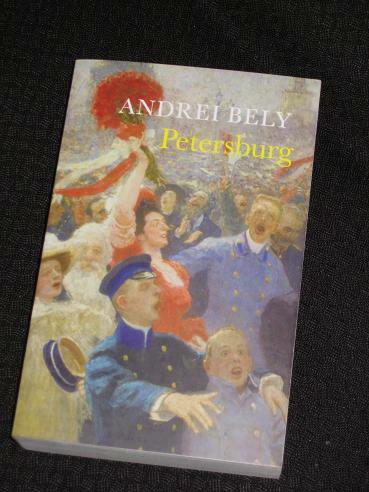 Petersburg (translated by John Elsworth) is set in the famous Russian city of the title during the autumn of 1905, just prior to the culmination of the 1905 revolution. Elderly statesman Apollon Apollonovich Ableukhov (how I’ve missed reading Russian names!) shuttles between his enormous, cold, empty house and his slightly-less frigid workplace, where he creates messages to be sent out to the far-flung corners of the empire. Meanwhile, his son, Nikolai Apollonovich, spends his days avoiding his university studies, lounging around reading Kant and paying visits to a beautiful married woman. The family relationships of the Ableukhovs, father, son and (later in the book) mother form one of the basic themes of the book, and considering the time the book was written, it is hardly surprising that their relationship is handled in Freudian terms. Of course, when the pivotal occurrence of the novel is the possibility of the son planting a bomb in his father’s bedroom, the words Oedipus complex do seem to scream out at the reader 😉 Bely gives us detailed descriptions of the two male Ableukhovs, in some ways very different, but in others so similar – in fact, at times the writer plays with their appearance making the son age into the father and the father turn back into the son. “There was a rush of wind from the sea: the last leaves fluttered down; there would be no more leaves till May; how many people would be there no more in May? These fallen leaves were truly the last leaves. Alexandr Ivanovich knew it all by heart: there would be bloody days, full of horror; and then – everything would collapse; so swirl then, whirl around, you last, incomparable days! When you add to this the fact that the opening comment (“Those were strange, misty days”) has already appeared several times over the past couple of pages, it gives you a good impression of how the book actually reads. Looking back at what I’ve written, I realise that I haven’t really said much about what actually happens in the novel, but to be honest that’s beside the point – Petersburg is about how things happen and how the protagonists feel while it happens. There are large traces of Dostoyevsky in the handling of the novel, but it definitely has a later feel to it, more of a Henry James feel than a Russian one at times. Despite this though, there is a plot, and with knowledge of the revolutions which are about to shatter Russian society (some of which had yet to occur at the time Bely first wrote the book), we can see how the writer has examined the seeds of these later events. Not a writer I'm familiar with & like yourself I love Russian Literature, as well as the giant shadows mentioned as Turgenev & Andreyev, making this a book I'm very interested in, thanks for posting on it. PS. Aren't those Names just wonderful. Thanks Tony: I'm going to buy this (not sure which translation yet) as I am a fan of Russian lit and this one sounds great. I'd heard of it but you gave me the nudge. Thanks for that review. I read the translation byRobert Maguire and John Malmstad (http://www.amazon.com/Petersburg-Bely/dp/0253202191) a few years ago, and found it fascinating. Modernism is generally reckoned to have started around 1920s or so, but to judge from this, or from, say, the paintings of Kandinsky, there were some remarkable things happening in per-Revolutionary 20thcentury Russia. Bely apparently never could decide on a definitive text, and as a consequence, there are, it seems, a number of texts out there all of equal validity. The text in the Maguire-Malmstad edition seems a bit shorter than this one (to judge from one of my recent bookshop-browsing sessions!) The original text is crammed with linguistic virtuosity, and while Maguire & Malmstad do a terrific job on that front, they also provide extensive notes at the back describing some of Bely's linguistic effects. I'd be very interested to read this version also, as, clearly, much depends here on the skill of the translator – even more so than usual. I've been trying to find what to say in this comment, but I guess it's pretty simple after all: this is the type of review that really makes me want to read Petersburg. These are lovely passages you've included, but more than that your descriptions of the language-love and the repetitions are quite attractive. That the general story behind the book sounds interesting certainly helps. I'm curious, though, in what regard you think people won't enjoy the book. Are you referring to the style as being divisive perhaps, or to the actual in-story plot/character content? Or is it something less specific? Gary – As I said, I'd never heard of him before trying this one, but I'd like to read some more (and yes, Russian names are the best!). Guy – Good to hear 🙂 I did like this translation if that's any help, and it's definitely a book where the translation is important. Language-driven? Noted. I first heard of it as the Russian Ulysses. I would say that the Ulysses comparison is a stretch. I guess it depends on what you emphasize. I do not remember Petersburg having the kind of variety of styles found in Ulysses, for example. It does have a “24 hour” structure. I also remember the plot as being pretty great – a ticking time bomb! – but Tony is write that the extraordinary part of the book is the brilliant creation of meaningful patterns, like what I recently described regarding Madame Bovary. Tom – It's definitely the 24-hour angle which is alluded to here (although it is linguistically inventive, just not to the degree that Joyce's work is). I must admit that one of the first things I did on finishing this was rush over to your blog and look for a review… in vain. Pre-blogging days? Yes, pre-blog, too long ago. Geez, I wrote “write” when I meant “right.” Still frazzled by that international flight, I guess. I hope. My library does have it, but in a different translation. I wonder if they'll let me ILL your translation instead. Eva – I'm not sure what the other one is like (Penguin edition? ), but I was very happy with this one 🙂 St. Petersburg really is a great setting for a novel too! I'm just getting to this post…yes, I'm always so top of things. I tremendously enjoyed Petersburg and glad to see others experiencing it. Glad to see you pointing out the sicknesses and repetition of the novel. I don't think I highlighted those points enough in my posts on the novel. Thanks!